The first question when considering Sales Training is about the need for it. Management of any company has to balance priorities and distribute budgets for the organization’s needs and requirements. So let us first attempt to understand what it takes to make an individual, team, or even an organization better at selling. If we look at the question from that perspective, then sales training is clearly an investment that will pay off with greater opportunities, higher sales closures, and retaining existing customers with lesser costs. Measuring sales training effectiveness is important. Begin by assessing the need for training. What are the goals that have to be achieved through this particular sales programme? The most common goal is to acquire new customers or expand the market reach. Or the product may have to be pivoted to be sold at a higher (with greater profit) sales margins. Sales are not just one activity. There are many specific skills that go into converting prospects into paying customers. Salespeople need to understand potential prospecting, conversation planning, relationship nurturing, needs analysis and prioritization, problem handling, purchase justification, consensus building, and negotiation. To improve customer acquisition, they have to be trained to prospect activity levels, improve the quality of prospecting customers, or even leveraging referrals. There are different types of sales performance optimization studies such as product/ service training, target audience profiling, marketplace training, CRM system utilization, and sales skills. None of these by themselves are enough. It seems logical that skills training can have a strong impact on skills, which will result in better performance. Let’s try and justify this position. We studied a research report by CSO Insights called The Business Case for Sales Training. CSO Insights conducted research of over 2000 companies for 2015 Sales Performance Optimization and Sales Management Optimization studies. The questions were on the different types of training and how they can have an effect on the bottom line of any company – small, medium or large. This report also considered the strong impact of sales managers who have undertaken sales training programmes. The results were surprising! Data suggests that only 9.6% of the respondents answered that the training had ‘exceeded expectations’, 33% said they ‘met expectations’. But 53.6% of the responses emphatically claimed that their current sales training programmes ‘needed improvement’. Sales Managers have an enormous impact on any organization’s ability to attract and retain top talent. New hires prefer to talk to them for knowledge, skills, and insights into the organization. Every company decides regular targets for individual salespeople, which together is the organization’s goal. However, even when some of them are unable to achieve their quota, their targets still go up. The question is, how to ensure that the team is able to perform as a whole. Organizations with salespeople who are happy with their training have a higher rate of target achievement. If your sales team is functioning at a lower level than you had hoped, it is time to reconsider the efforts you are putting in to help them. Usually, employees do want to be good at their job. It is up to you to equip them with the right tools and techniques to help them achieve the targets you set. Another aspect where sales training is non-negotiable is when you realize that efforts with training have a much stronger closure rate than without. 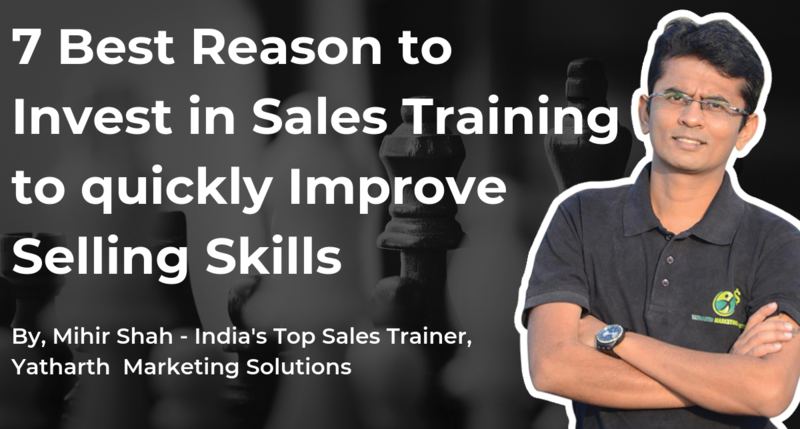 Companies who invest in effective sales training report significantly higher win rates than those whose training programmes ‘need improvement’. However, they also need to be trained to close deals that are not going as per the script. They have to be quick on their feet, and strong in their responses. This is where strong sales training programmes make all the difference to how your organization fares in the market. Sales Training is crucial in helping salespeople get a proper understanding of customers. They have to identify the needs of the customer and address this need to make a sale. It is a proven fact that customers respond positively to sales conversations that are relevant to their problems. In the above mentioned CSO Insights report, results show that companies with sales training programmes that were rated exceeding expectations had better performance records than those that met expectations. Even more tellingly, they were considerably better than companies with training programmes that needed improvement. Organizations invest money and time in sales teams. The investment pays off when these teams deliver the results expected of them. But when the employees are demotivated, there are greater chances of them looking for outside opportunities. High sales employees attrition is a great disadvantage to the organization. Blog Post: 7 Actionable Sales Techniques that Work Great in 2019! Any successful high-performance athlete will tell you that they could achieve their greatness through their careful coaching. Frontline sales managers are directly responsible for the performance of the team under them. But they too need to be taught the skills of team management. When they understand the complete sales process, they can deliver the requisite sales training outcomes. Research shows that companies with ‘exceed expectations’ sales training programmes achieve their targets faster than those with ‘met expectations’ programmes or companies with disappointing programmes. The team is always greater than the team members. When a team is working in tandem with the members, the results are considerably better than individual rockstars. Moreover, this reduces the burden on the team members, thus improving the productivity of the entire group. Sometimes, salespeople are caught up in the actual sale. They overlook the other aspects of the job i.e., the record keeping, making the notes of the sale. This can have a negative effect on the effectiveness of the group. Sales skills training will orient each member of the team to empower each other and bring out the best in everyone. Companies that offer effective sales training usually focus on current and future performance improvement. The most in-demand skills are building relationships, identifying customer needs, and demonstrating value. When companies offer actionable sales training, it leads to higher closure rates of sales opportunities. Salespeople with actionable sales training report higher levels of satisfaction in their jobs, and thus less likely to quit the organization. This has a positive impact on the overall sales cycle of the organization. When companies offer actionable sales skills training, newer sales employees are able to start delivering results faster.